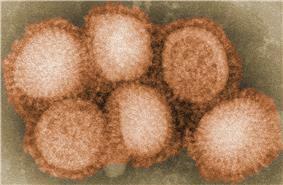 H2N2 is a subtype of the influenza A virus. H2N2 has mutated into various strains including the Asian flu strain (now extinct in the wild), H3N2, and various strains found in birds. It is also suspected of causing a human pandemic in 1889. The geographic spreading of the 1889 Russian flu have been studied and published. Some researchers have asserted that the 1889–1890 flu pandemic (also known as Russian flu) was caused by the influenzavirus A virus subtype H2N2. More recent research has suggested H3N8 as a more likely cause. It is the earliest flu pandemic for which detailed records are available. "The 1889 pandemic, known as the Russian Flu, began in Russia and spread rapidly throughout Europe. It reached North America in December 1889 and spread to Latin America and Asia in February 1890. About 1 million people died in this pandemic." The category 2 Asian flu pandemic outbreak of influenza A virus originated in China in early 1956, and lasted until 1958. Some authors believe it originated from a mutation in wild ducks combining with a pre-existing human strain. Other authors are less certain. The virus was first identified in Guizhou. It spread to Singapore in February 1957, reached Hong Kong by April, and the US by June. The death toll in the US was about 69,800. Estimates of worldwide deaths caused by this pandemic varies widely depending on source, ranging from one to four million, with WHO settling on "about two million". The Asian flu strain later evolved via antigenic shift into H3N2, which caused a milder pandemic from 1968 to 1969. ^ "Encarta on influenza". Archived from the original on 2009-10-31. ^ a b Greene Jeffrey. Moline, Karen. (2006) The Bird Flu Pandemic. ISBN 0-312-36056-8. ^ Belshe Robert. (2005) The Origins of Pandemic Influenza. New England Journal of Medicine 353:2209-2211. ^ Roos, Robert (Apr 13, 2005). "Vendor thought H2N2 virus was safe, officials say". Center for Infectious Disease Research and Policy.